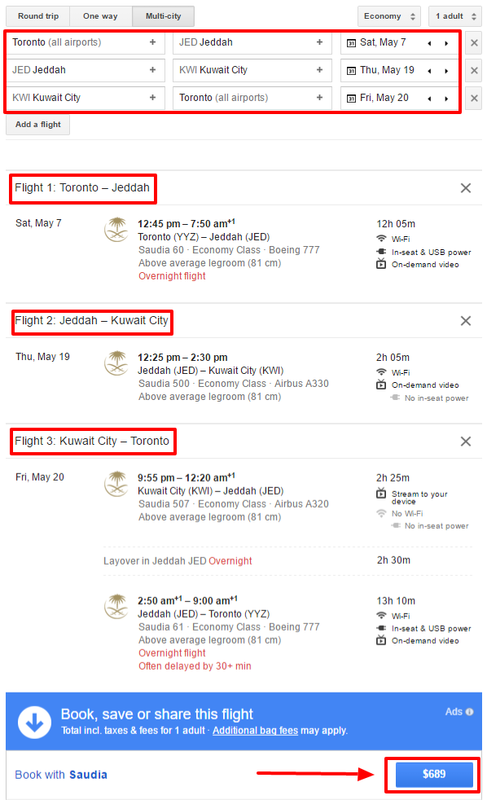 Normally $1200 CAD for a direct route /w taxes return from Toronto to Jeddah for 2016, the only way to drop that price is to have a 1 or any number of nights stopover in Kuwait. 2) Google will refer you to book with Saudia Airlines for $689 CAD. We have chosen a sample itinerary of Departure from Toronto to Jeddah on May 7th, stopover from Jeddah to Kuwait on May 19th, and return from Kuwait to Toronto on May 20th. 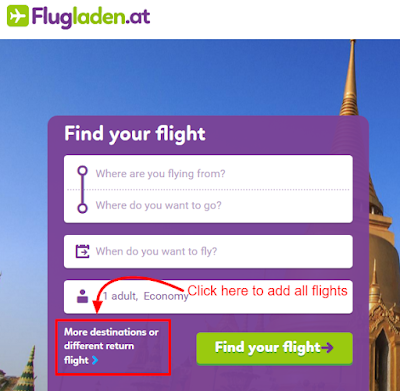 3) To find an even cheaper price, open a new page in your browser and go to Flugladen.at/en, and choose "More Destinations" search. 4) Add the same dates and destinations that you found on Google Flights. Price will show as 422.23 Euros. 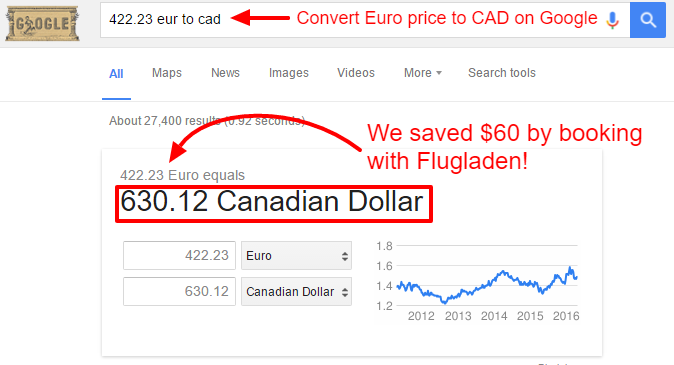 5) Convert the price in Euros shown on Flugladen to Canadian by searching "422.23 eur to cad" on Google. If you're happy with this price, go ahead and book on Flugladen! Question: I booked a flight to go to Jeddah, where can I get an Umrah visa? 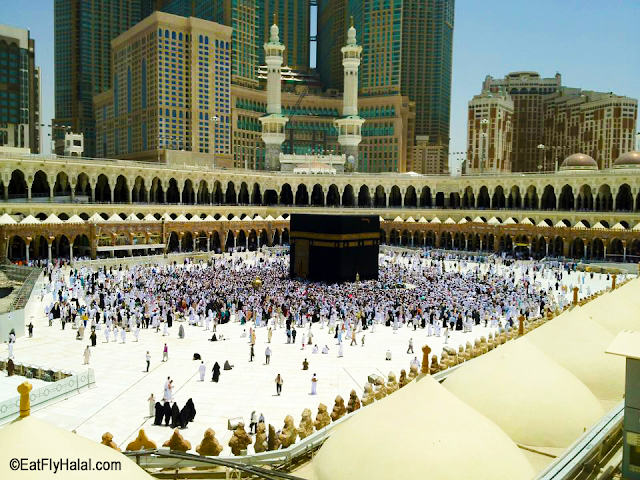 Answer: Click here for our thorough guide on how to get an Umrah visa from the Canadian Saudi Embassy in Ottawa. Be sure to share this post with friends and family on our Facebook Page! Comment below or on Facebook. We hope this guide was helpful inshaAllah! The above dates no longer has above fair price. You may have to play around with the dates a little bit. You can also go to google flights and search for Toronto to Kuwait in "Round Trip" search which will show all the available price drops mentioned in the article in April, May, and June, and then model your Multi-City flight according to those dates. For your accommodations in Cheap Hotels in Madina or Makkah, visit the only up to date online platform of Haramayn Hotels.